There's no state-based action involved here, only layers and continuous effects. 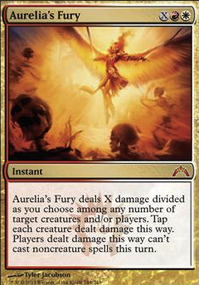 Archangel of Strife's effect applies in layer 7c, where effects that modify power and toughness go. This makes your creature 2/11. Invert / Invent's P/T switching effect applies in layer 7e. Your creature becomes 11/2. If you had chosen war instead, you would have an 8/5 creature because it would become a 5/8, then its power and toughness would be switched. I have a 2/8 creature on the battlefield, then cast Archangel of Strife choosing peace, making it a 2/11. If after that I cast Invert / Invent to switch its power and toughness, does the creature become an 11/2, with the state based action immediately making it a 11/5, or does it just become an 8/5? Conversely, if I had chosen war, what would happen to the then 5/8 creature upon Invert / Invent resolving? Let me know if clarification is needed. Thanks! Possibility Storm is probably the greatest enemy of all to control players there is and it has little down side for your deck. Karmic Guide is a useful angel and helps with removal problems and Angel of Serenity is good removal/recursion. 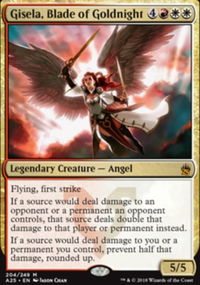 If you prefer more protective measures there's Aegis Angel, Archangel Avacyn Flip and Deathless Angel for in tribe options. 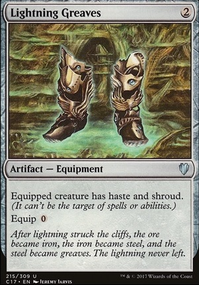 You may want to add more cards that cheat angels into play like Cryptic Gateway and Quicksilver Amulet to help the beat down come out faster, also has the bonus of being at instant speed. I think you are better off skipping the voltron route as its kinda slow and instead aim for haste and extra combat effects like Aggravated Assault (goes infinite with Sword of Feast and Famine), Combat Celebrant, Waves of Aggression and just crush your opponents quickly. If you go this route Crescendo of War and Archangel of Strife will make things very interesting. 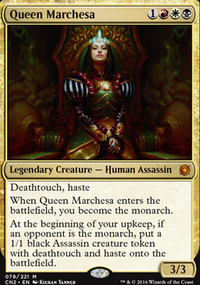 With that in mind you may have better luck with Aurelia, the Warleader piloting the deck, I personally think the extra combat step is more valuable as your not geared to exploit pinging damage or burn spells with Gisela, Blade of Goldnight. If you don't swap her out you should add Heartless Hidetsugu then and exploit that damage bonus. Thanks! Aggro and Control are definitely things that you don't see together too often. Noetic Scales could be good against decks that dump their hands, and like you said, my walls would be safe. Stoic Angel and Derevi might be good for some more control, I'll have to think about them. Aluren would be good, my walls have low cmc and come in powerful. I also wouldn't have to worry about completely running out of resources because of Arcades. 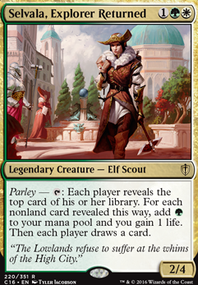 Vizier of the Menagerie could help, I'll think about it. I'm not really sure about Door of Destinies, Kindred Discovery, and Descendants' Path. With door I'm worried about boosting so much that I still die to my board wipes, I feel like I have enough card draw without Kindred Discovery, I also worry about burying spells I might need with Descendants' Path. Archangel of Strife is a good idea, with "peace" mode my walls essentially get +3/+3. Angelic Skirmisher is good too; I can enable vigilance if I don't have it, or give my walls some other advantages. Thanks for the suggestions! If you have any idea what cuts I could make to include from my maybe board then go ahead and suggest them. Your deck looks pretty good for aggro-control. Noetic Scales should be really strong since your creatures won't get bounced due to their low power and your card draw, while you totally disrupt opponents. 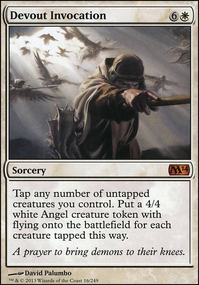 Stoic Angel and Derevi, Empyrial Tactician can help you pursue a stax strategy. Aluren is really powerful since most of your walls have low CMC, whereas you aren't worried about low CMC creatures your opponents might have. Vizier of the Menagerie could help you cycle through your deck really fast. Some tribal cards like Door of Destinies, Kindred Discovery, and Descendants' Path could be helpful. Maybe Archangel of Strife and Angelic Skirmisher could be useful. 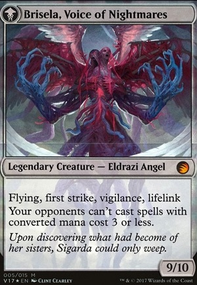 You have a lot of etb creatures so you can consider adding Panharmonicon I can only imagine the interactions you get with Archangel of Strife or Magister of Worth lol. Manabarbs und Pyrohemia sind halt mega geil mit Gisela, Blade of Goldnight, weil man quasi selber keinen Schaden bekommt und zum Beispiel jede Runde boardwipen kann. Deflecting Palm und die anderen Damage-Umleiter hatte ich halt drinne, wegen den Schaden-Verdopplungseffekten von Dictate of the Twin Gods, Furnace of Rath und vorallem Goldnight Castigator. 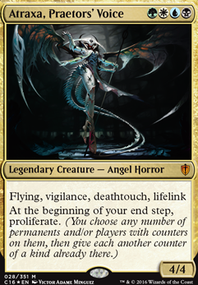 Guardian of the Gateless, Price of Progress sind halt auch ganz nett mit Gisela und Archangel of Strife, Crescendo of War und Fumiko the Lowblood sollten dafr sorgen, dass die Gegner sich gegenseitig kaputt machen beziehungsweise ich doppelt von den Boni profitiere. Scourge of the Nobilis, Lightning Bolt, Platinum Angel, Mages' Contest hab ich raus gemacht.